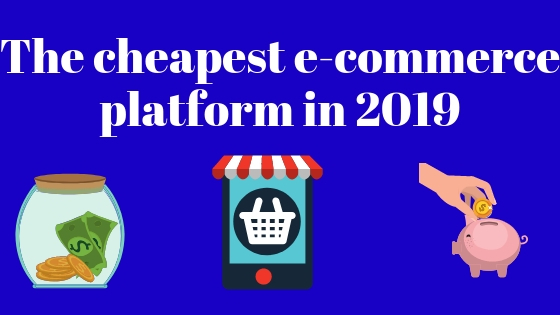 The purpose of this page is to simply share what are the cheapest e-commerce platforms that can be comfortably recommended to those who are looking to open an online store. This page only includes those e-commerce platforms that have an open and clear pricing model, this is because often people who are looking to for a cheap way to open an online business can be put into especially uncomfortable situation if an e-commerce store builder starts charging some surprising fees that the store owner was not fully aware of when he or she started to build the store. If your goal is to try to quickly build a good sized store, despite of wanting to do so with a small budget, it is hard to go wrong with Shopify. On Shopify the cheapest proper e-commerce plan costs just $29/month, but you can actually even get a really nice discount on that price if you are willing to pay for a year or two in advance. However if you don't feel like it, you don't have to commit to Shopify for a long time: you can easily start your store and if after two months you feel like ecommerce is not for you, you can just cancel your Shopify subscription instead of having to pay for time that you don't even have your store online. Open your Shopify account now. The benefit of the Shopify's $29/month plan is that you can add an unlimited amount of products to your store and you can also sell as much as you want, for example, in the second cheap option displayed below, there is a limit on how much you can sell on their cheapest plan. One nice benefit of using Shopify is also that, that you don't have to theme to run your store, instead you can use one of the free, but nice looking and well functioning Shopify themes. $9/month Shopify plan. As mentioned the cheapest proper plan (for a dedicated e-commerce store) costs $29/month at Shopify, however they also offer a service called "Shopify lite" with which you can, for example, add products to sell on your existing website - this plan is priced at just $9/month. So if you already have a website and audience to sell products to, this might actually be even better option than the $29 plan. Go to Shopify now and choose your plan. If you are confident that you won't do lot of business through your store, you might want to consider choosing 3Dcart instead of Shopify. This is because 3Dcart has a plan called "startup" which is just $19.90/month (and there is at the time of writing this also a nice promotion that gives you a limited-time discount on that regular price). However, the downside of choosing this plan is that, you can only sell $50,000 worth products in a year on this plan. After that you have to upgrade to a more expensive plan. So as mentioned. If this sounds good, click here to open your 3Dcart account. Some of the other big e-commerce platforms include for an example Bigcommerce and Americommerce. The cheapest solution offered by Bigcommerce costs $29.95/month and the cheapest solution offered by Americommerce costs $24.95/month. If you were to go the route of having a custom built webstore the costs could easily run to thousands of dollars and in addition to that the time it would take to launch your store could be weeks if not even months - when on the other with the ready made e-commerce softwares you can start selling the same day you sign up for the service. In 2018 you could still make the argument that Volusion might actually be the cheapest e-commerce platform for building a standalone store, as they had a $15/month plan called "mini". However, now in 2019 it would appear that they have removed that plan and now their cheapest plan is at $29. Although, it is obviously good to note that in the case of Volusion's plans there is 10% annual discount, so for example that $29/month plan becomes a $26.1/month when paid for a year in advance. Can you trust a cheap ecommerce platform? While it obviously depends on the specific service provider in each case, it can be said that generally speaking the companies offering cheap solutions are also very trustworthy. Shopify, for instance, is currently listed in the New York stock exchange and has a market valuation of around $10 billion, so it is not some tiny startup company run from a garage. The fact that the company is listed in the stock exchange also means that you can always get pretty good up-to-date information on how well the company is doing financially. It is also good to note that because the e-commerce software providers are selling intangible products that can be extremely easily replicated, "producing" more of the same product costs them basically nothing and as such cheap price doesn't equal bad quality. While it is a very difficult, if not impossible, to find a high quality e-commerce builder that you could use for completely free, it is good to know that basically all the big platforms offer free trials. For an example in the case of Shopify, they actually offer a nice 14 day free trial during which you can test the platform, and only after that you have to decide if you want to build an actual store using their service, or if you would rather go with some other solution. And best of all, you don't even need to give your credit cards to get the free trial. When starting with an inexpensive solution it is nice to know that all the major e-commerce solution providers have made it very easy to upgrade to more premium options. So in other words, you can use the inexpensive plans as a way to get to know the features that the software has, and if you get a good feeling you can easily upgrade to a slightly more expensive system that provides even more features. Selling through Facebook can be a nice way to get started in selling items online or a good addition to your ecommerce website, but you really should consider having a dedicated website for your store, in case you don't have one yet. Having a dedicated store helps with branding, makes it easier for customers to remember your store, makes it easier to customize your offering and also makes your website a more attractive acquisition target to potential buyers, which is important in case you are hoping to sell the business one day. It is also worth mentioning that it is bit weird to link to your Facebook store, for example, from Twitter or Pinterest as those are in a way competitors of Facebook. Running a store on a dedicated domain name also adds a certain type of level of security as you are not at the mercy of the social media platform and don't have to worry about the potential changes they might make to their system, or the fact that consumers' might start spending their time online somewhere else - as we know, for example, from the case of MySpace the popularity of platforms can change drastically. In case you are afraid that you might not have the technical skills to build a dedicated ecommerce website, I would like to simply encourage you to try one of the more popular e-commerce solutions - the odds are that even if you have absolute no experience with building websites or coding or anything like that, you will notice in couple of hours that it is actually extremely easy to build your own online store. FWIW, In my opinion the best ecommerce platform for beginners is Shopify. They really seem to have understood how to serve people who don't have lot of experience with selling through their own online store. If you are looking to get started cheaply in running an e-commerce business, the best way do to it is probably by trying dropshipping. Dropshipping is a concept in which you are basically just the middle man between the end consumer and the producer of the product. The way it works in practice is that you list products on your store without buying the inventory to yourself and once someone buys something from your store, you simply forward the order to the producer who then ships the product to the consumer. So in other words, when you are running a e-commerce business in this manner, you don't have to invest any money into inventory - having to buy inventory can obviously be extremely expensive and also carries significant financial risk, if your store doesn't start producing income rather quickly. If you plan to use the dropshipping-model for your e-commerce store, Shopify is probably by far the cheapest way to do it. This is thanks to the platform's strong integration with Oberlo, which allows you to do 50 drophipping orders for free per month. Oberlo also has a great catalog of products listed on their software, so you don't have to spend any time and money on trying to find the vendors who are willing to do dropsipping.